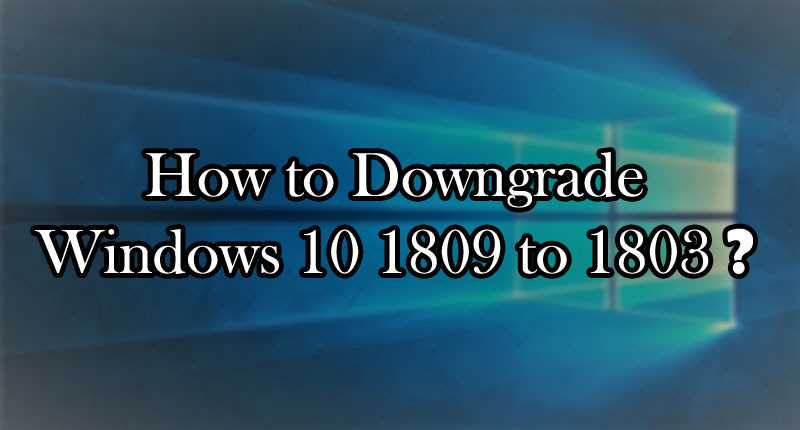 This article of Geeabo teaches you how to Downgrade Windows 10 1809 to 1803. Friends, In July 2015, Windows 10 was first launched with the 1507 version and now in October 2018, it comes to 1809. Between these two versions, too many builds come but I personally not happy with all the versions. And I think, 1703 is the best version till now in my opinion. On 3rd October, I installed Windows 10 1809 in my PC. And I’m quite happy with this version of Windows 10 1809. I didn’t face any major issue till now in this version. This is very stable and fast. 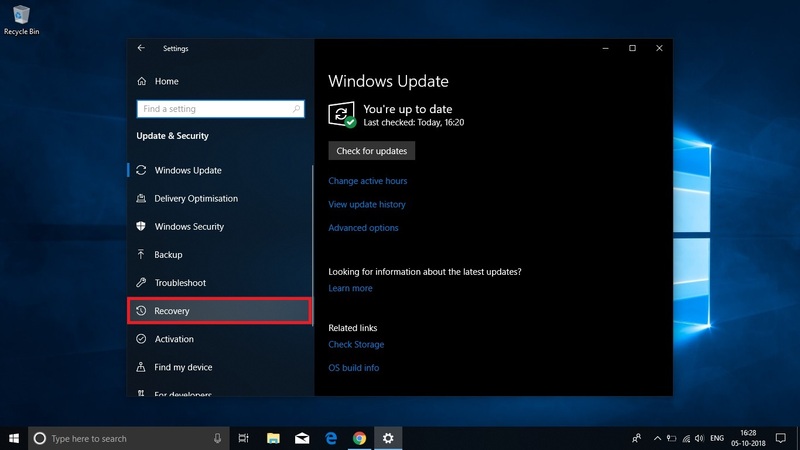 But if you are facing any issue in 1809 update and you want downgrade windows 10 1809 to 1803 then you have an official way to go back to the previous version. Before going back to an earlier one, please check this Windows 10 1809 Review After 4 Days Of Use – Top 7 Features. 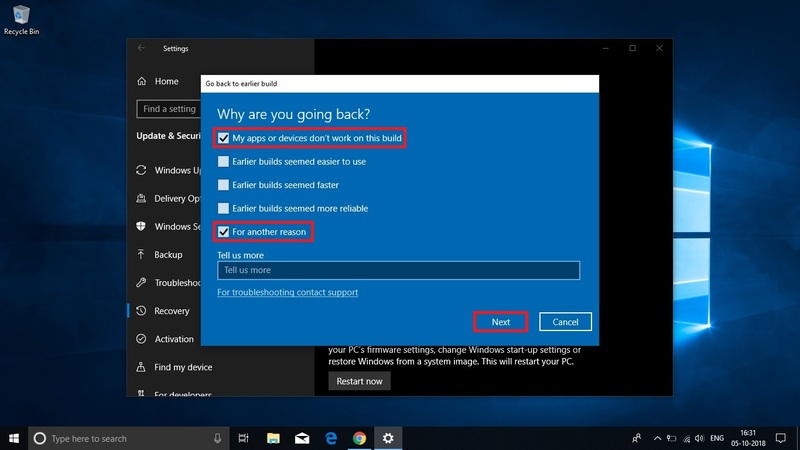 Friends, while looking at their customer and taking care of their better experience, Windows gives you an option to Go back to the previous version. If this version isn’t working for you then try going back to an earlier one. This option is not showing permanently. So, if you face any problem then go back to the previous one immediately. But before going back, once check for the updates because this may solve your issue. Now come to the steps. #1. 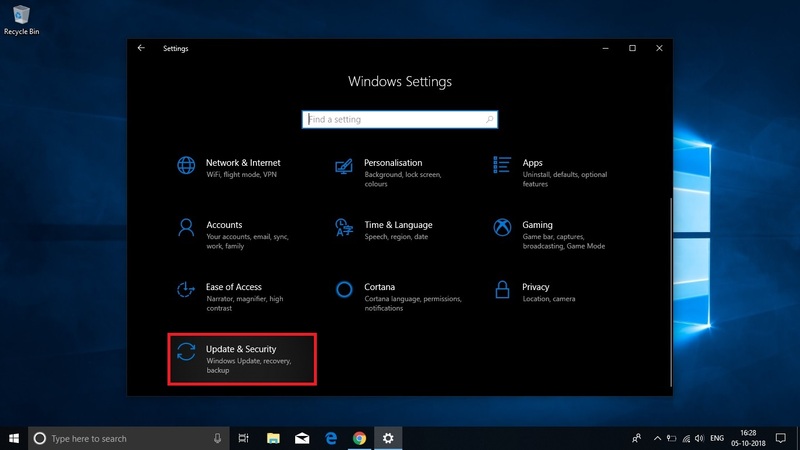 Click on Update & Security under Settings. #2. Now Click on Recovery. #3. 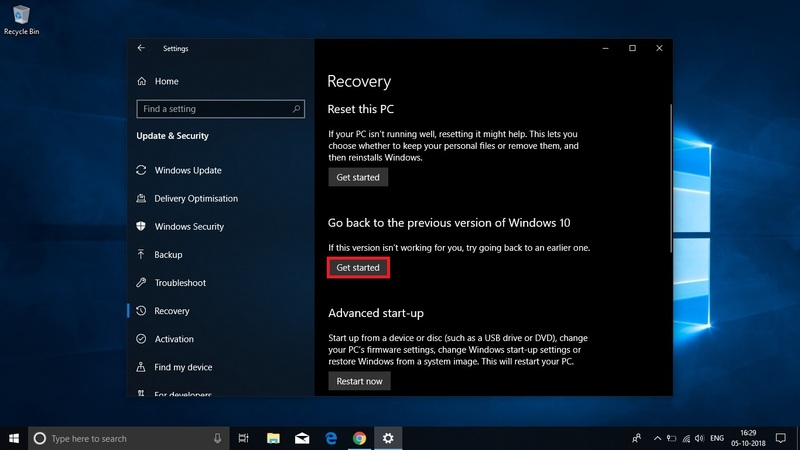 After that, click on the Get Started button which says that ‘Go back to the previous version of Windows 10’. ‘If this version isn’t working for you, try going back to an earlier one’. #4. Now Windows ask you that Why are you going back? So, simply tick as I shown in the image or you can choose or write some other reasons too in the Tell us more field then click on Next. #5. 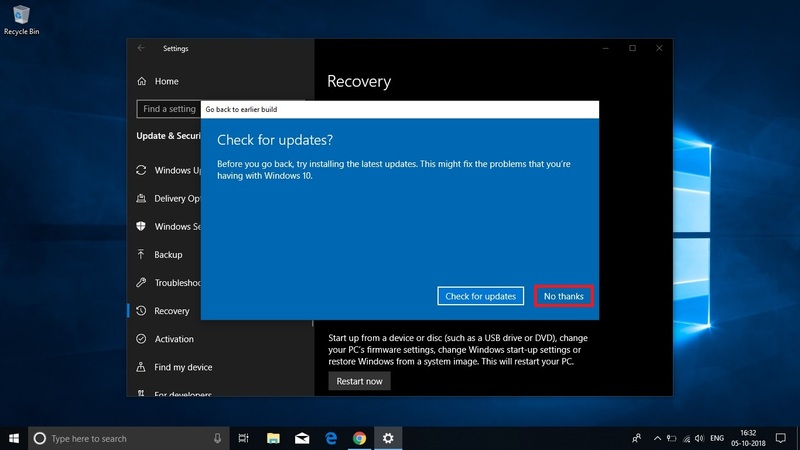 Now, Windows ask you that Do you want to check for updates? Because this might fix the problems that you are having with Windows 10. So, before going back I personally recommend you to once check for updates. #6. Now, in 6th step Windows gives you some warnings, terms, and condition. This might take a while, and you won’t be able to use your PC until it has finished. and more. So, read all the terms carefully and then click on Next. #7. Now, If you used a password to sign in to your previous build, make sure you know it. This is an important thing to know. So, be sure that what password you used in your previous build to operate or unlock your PC. #8. And now the final step says that Thanks for trying this build. So, now simply click on Go back to earlier build button. So, now simply wait until the downgrading process complete. Downgrading the Windows is not a big deal. I will tell you this thing because you didn’t have to face any issue in your PC. Try to update your PC always because updating always fixes your bugs. Using an old version is not the permanent solution. Try to fix the issue. If you tried and can’t fix them then let me know in the comment section below. So this was the procedure to Downgrade Windows 10 1809 to 1803. If you liked this article, please Like, Comment and Share it On Facebook, Twitter, and Google+. Windows 10 1809 Review After 4 Days Of Use – Top 7 Features. Recover Forgotten Windows 10 Local Account Password. How To Take A Screenshot On Windows Computer?